We’ve had a bit of rain, and a couple of cold nights, which means it’s time to harvest all the veggies before they go bad. Down the road there’s a local farm that welcomes members to pick all the goodies and leave some cash based on the honor system. 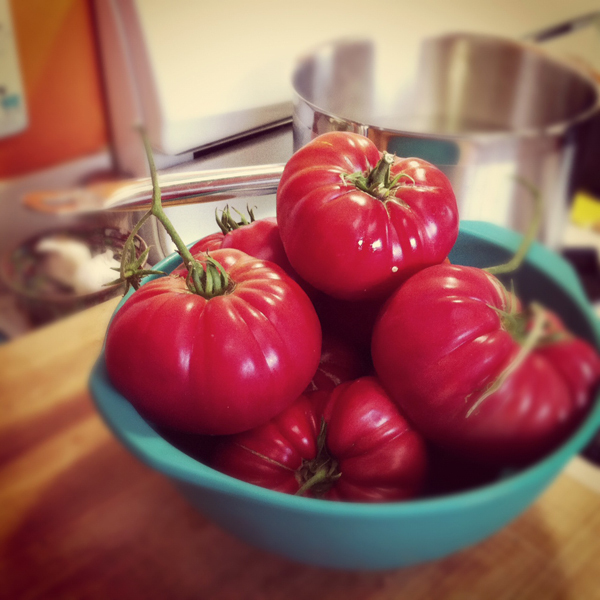 I headed over and loaded up on tomatoes, brought them home, and picked the few remaining from our sad little vines. I haven’t made homemade sauce before, but knew it was the best way to savor the wonderful flavor of the ripe red beauties. 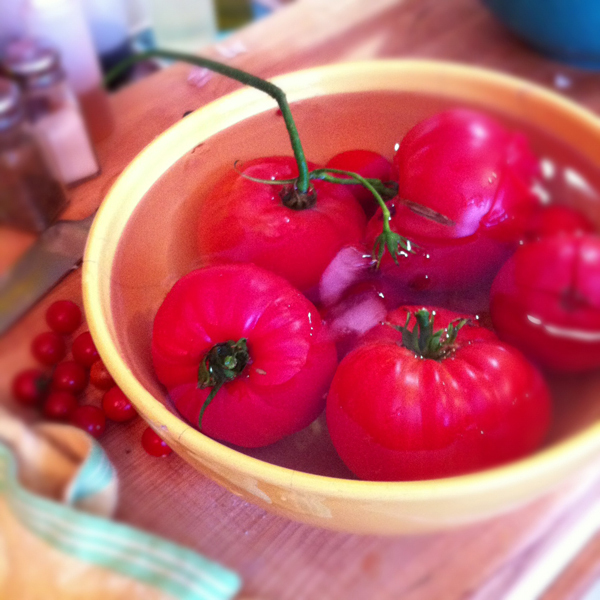 Place the hot tomatoes in a bowl of ice water and let sit for a moment. Now the skins will just peel away from the tomatoes. 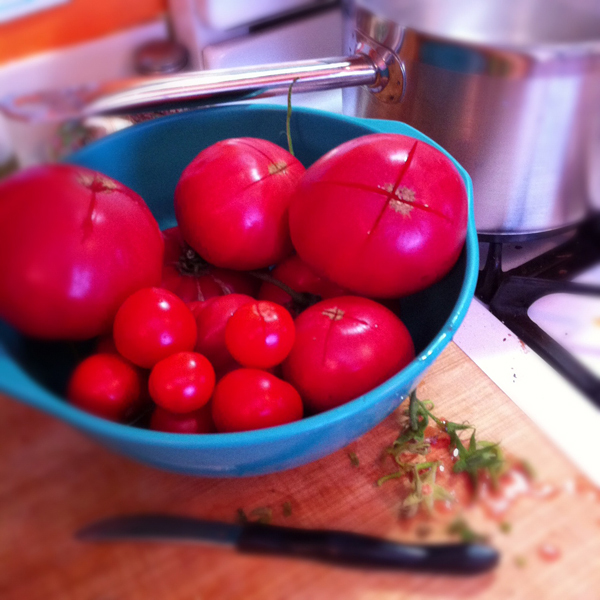 While you’re removing the skins, place the tomatoes over a bowl with a strainer over the top, and give them a squeeze to remove the seeds, but save the juice in the bowl beneath. Warm a tablespoon of olive oil with a few cloves of crushed garlic until the cloves start to sizzle and then add the crushed tomatoes and juice, ditching the seeds and skins. Sprinkle in some salt, a pinch of sugar, and a good dash of Italian seasoning. Let simmer for 10-minutes. 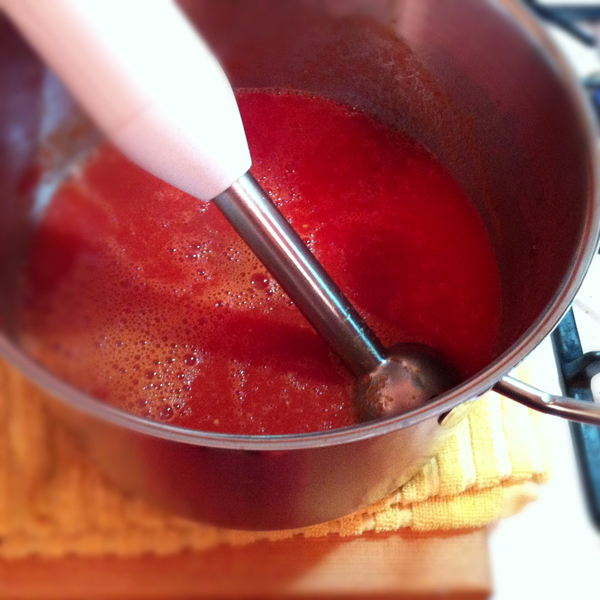 Now remove from heat and blend the tomatoes with a hand blender or in batches in the blender. Be careful — this stuff is hot! Give your sauce a taste and adjust the seasoning to your liking. 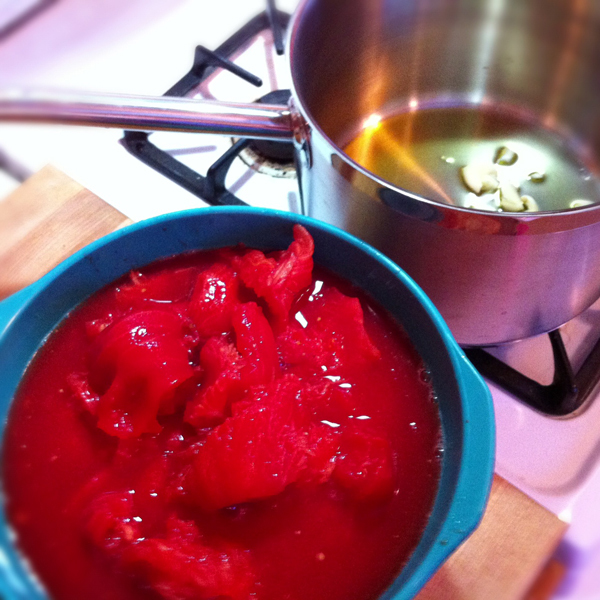 Place the sauce back in the pan and simmer on low for at least 30-minutes, reducing the sauce and deepening the flavor. 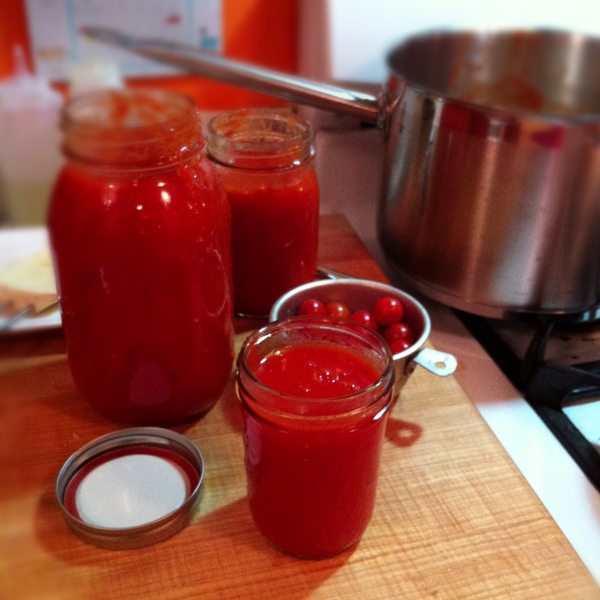 Once you’re happy with the consistency and flavor, turn off the heat and let the sauce cool before ladling into jars. Use for topping your favorite pasta, making tasty lasagna, or as a pizza sauce.